Here’s an extract from the book of the week, Crossover Leadership in Asia: Staying Whole in Two Halves, From Civil Society to Government, published by InciteGov. Indications of payback continued to mount, and the issues surrounding the presidency would only take a turn for the worse. In June 2005, tapes of the conversations between President Gloria Macapagal-Arroyo and former COMELEC Commissioner Virgilio Garciliano surfaced, causing widespread public fury and outrage. It was the worst crisis ever faced by the Arroyo administration, which inevitably drove Juliano-Soliman and nine (9) other Cabinet members to the edge and eventually, out the door. 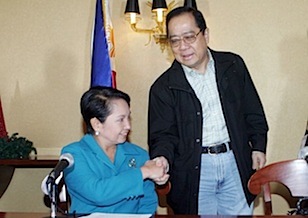 When Songco told Juliano-Soliman about the results of the meeting, she was in complete denial. This surprised Songco. “Dinky told me, ‘Hindi naman talaga kayo sigurado na siya yun eh (you are not really sure that it was her).’ That was still her position at the time. So I told her ‘Dinky, I want you to know that your allies in civil society are taking a different view, and that we no longer support your president. '” Songco thinks that in a way, this compelled Juliano-Soliman to re-evaluate her point of view on the issue, on which she was still dilly-dallying on within the the very short period of time leading to the Hyatt 10 resignation. When Juliano-Soliman became convinced that it was the president in the tapes, she was immediately confronted with two questions that she needed President Arroyo to address. “First, I wanted to know what the tapes were about. Why did she do it? And second, I needed to know what we should do.” However, the president did not want to talk to the Cabinet members, including Juliano-Soliman, about the situation at the time. To restore the positive image of the president, the entire Cabinet agreed that the first order of the day was Mike Arroyo’s exodus from Philippine politics. This was the first recommendation presented to the president by de Castro, Ermita, Claudio, (Department of Finance Secretary) Cesar Purisima, (Department of Trade and Industry Secretary) Juan Santos, (Presidential Adviser on New Government Centers) Rodolfo del Rosario and Juliano-Soliman. “The decision of the Cabinet to let Mike Arroyo go was unanimous. We felt that to gain back credibility, the first thing to do is to ask the First Gentleman to leave. And we told the president that everybody thinks that the malaise in the administration has to do with him. If he hibernates, that will lessen the public distrust.” The president said that she would discuss the matter with the First Gentleman, but already expressed her support to the recommendation. The second recommendation of the group was to ensure that the people associated with the First Gentleman, who were appointed in revenue generating institutions in government, would also leave. Three prominent names emerged in the discussions: Philippine Amusement and Gaming Corporation Chairman Ephraim Genuino, Manila International Airport Authority General Manager Alfonso Cusi and Former Department of Agriculture Undersecretary Jocelyn Bolante. Since the president had not been attending the Cabinet meetings since June 27, 2005, seven officials were assigned to deliver the message to President Arroyo. They were de Castro, Ermita, Claudio, Purisima, Santos, del Rosario and Juliano-Soliman. The effort to convince the president to speak up continued. “Our third meeting at Cambridge (Circle in Forbes Park, referring to the President’s residence) was specifically organized by Cruz because he knew the majority of those in that meeting, if not all of us, were not willing to stay if that tape was not explained. So in that meeting, we were directly telling the president what our constituencies were telling us, and what we thought she should do. We told her that the people will not buy the alibi that she did not know she was being taped, because she is the president of the land. We also told her that even if she did not know that she was being taped, people would ask why she is not doing anything to find out who did it to her. But in the end, she still insisted on not talking because according to her, that was the advice of her legal advisers.” After that meeting, the Cabinet members proceeded to Cruz’s residence to go over the issue many more times. The agreement, which they only reached after the meeting ended at 3:00 a.m., was that Cruz would help ensure that their recommendations will be implemented. Everyone was hoping that the announcement was the public apology they were waiting for. It was, according to Cruz and Ermita. When Juliano-Soliman and other arrived in Malacañang, they asked what the message was, which they believed was in the speech drafted by Cruz and Santos. It turns out that the speech that would be read by the president was prepared by a public relations and a legal group. In the days that followed, Juliano-Soliman was waiting for the President to respond to the issues being raised by their constituents, civil society groups and some members of the church. “We assured these people that the president will speak about her commitment to the reforms that we agreed upon. We followed up with Cruz and Ermita, and they also assured us that the president will address these matters.” But after the president made the statement on June 29, 2005 that Mike Arroyo will be leaving the country, she made no other public statements that pertained to the reforms. Other Cabinet members held similar views. So on July 8, 2005, (Department of Education Secretary) Florencio Abad, (Department of Trade and Industry Secretary) Juan Santos, (Department of Finance Secretary) Cesar Purisima, (Department of Budget and Management Secretary) Emilia Boncodin, (National Anti-Poverty Commission Secretary General) Imelda Nicolas, (Presidential Adviser on the Peace Process) Ging Quintos-Deles, (Department of Agrarian Reform Secretary) Rene Villa, (Bureau of Customs Commissioner) Alberto Lina, (Bureau of Internal Revenue Commissioner) Guillermo Parayno and Juliano-Soliman, all members of the Arroyo Cabinet, resigned from office. benign0, in a democracy, all of the above. geo, bald liars how, as demonstrated by those sterling advocates of truthiness, NBN 4, channels 9 and 13, radio ng bayan, messrs. bunye, ermita, etc? …. lalo na pang si Ping Lacson ang nasa Poder. Ping Lacson next president? God bless the Philippines!!!!!!!! Right now billions of corruption money are being funneled to this greedy group already rich and high up in the economic totem pole. Now whose fault is this? If we know who really are in fault, what are we going to do about it? What are you going to do about it? what are you going to do about it? what can you do about it? rego: Ping Lacson has a following, and if you read his self-portrait in pinglacson dot blogspot, even Mother Teresa will vote for him. The man claims that there is not a single blemish to his career. To quote: “It would have been easier for me to simply not rock the boat. Go with the tide, they told me, no drastic changes in decade-old policies of corruption Ã¢â‚¬â€œ get the usual share of jueteng payola, get the standard 20% commission on supply and contract signed, avail of the P40M-a-year so-called command and commanderÃ¢â‚¬â„¢s reserve, then enjoy the loot in retirement. No controversies, no enemies Ã¢â‚¬â€œ neat indeed! But I chose to stick to my principle Ã¢â‚¬â€œ What is right must be kept right. What is wrong must be set right. The results were good and very encouraging. Corruption among my policemen was at its lowest during that time. My policemen were disciplined, even became physically fit to perform their duties and mission of keeping the peace and serving our people. Be certain that I am doing something about it. Perhaps this a question in general terms. First of all organize, a good start would be anti-corruption organizations. Know what is wrong with the current system. Make a framework on how to fix the system. Consult with other organizations of their ideas. Know what the nation and the people as a whole needs. Know what you want. Know your enemies. List your enemies. Plot your course of action. Expand. Be active. Use your common sense. Make good governance your ideal, focus first on the good then make this a basis for correct governance. The strategies and tactics are countless and formless. Find a framework where you and your peers first should agree on, then work from there. But the point is MOVE and RIGHT NOW! Ping Lacson? In the words of PDI columnist Juan Mercado: “master manipulator”. If I may add, murderer, criminal. Just look at his eyes. The smile doesn’t reach the eyes, that is, without much effort (cguro coached by his PR gurus kaya ngumingiti na). With GMA, she has look the look of someone always smelling something fishy or skanky. She smells herself? Or her husband cguro. Jeez, now being against bad journalism is being pro-GMA, eh? Pro-corruption too, I guess. I bet you I can find several cases of poor journalism per week. Misleading headlines are the easiest to identify, but poor cross-checking or multi-source verifications are the hardest, usually. Fortunately, INQ often admits that it’s info is based on a single, anonymous source (but then treats the info as gospel, forgetting to use necessary terms like “alleged”). As seen worldwide, using “anonymous sources” is a favored method for journalists to write their bogus stories. Take the case of the Manalac/witness/Spratly story. Where are the editors? Did any writers get reprimanded? Any retractions, apologies, clarifications? Anything? Sorry to say, mlq3, but it seems to me that “The Search For Truth” has required the searchers to willingly disregard some truths and lies that don’t fit in their pre-conceived notion (claim) of what Truth is. And the media plays right along. Lozada lies, Drillon lies, Binay lies…but never mind that, it’s the truth we’re after!!! Yeah, right. BTW, is there a legit “Truth in Media” organization in the Philippines? geo, you miss the point. you said dinky et al. were liars. based on what? i asked, based on rebuttals in the state media? and you then responded with a catalog of omissions and commissions by the non-state media. is there a body that identifies these things? yes, the philippine journalism revue, of the center for media freedom and responsibility. it does so, quarterly, paper by paper, media outfit by media outfit. again, with your penchance for turning arguments into a moving target, please feel free to catalog the lies of dinky et al, and your sources for what you consider their lies. Hah! And just as I post that, here comes a pissed off Manalac. The Search For Truth requires the very principles of truth. I bet he rips into the media during the Q&A. Even facts about his employment were wrong. gloria still around 2010? God help us all! no way she will give up her powers. she had shown that over and over again that she will not hesitate to do anything to hang on to her presidency. where’s my evidence? no need to enumerate we all know what steps she took everytime she’s involved in every anomalies, plenty of times. do you think she will submit herself and her kampons to post 2010 admininstration? i doubt it very much. right now she is just fighting for political survival, imagine what she will do when she will be fighting for her life? again, God help us all. geo: yes. and how did you find out media, specifically, the pdi, was wrong? thats why i find the name ‘center for media freedom and responsibility’ funny because all media want is just freedom. the heck with responsibility. i hope everyone in media will admit – each one of them is not really a detached observer, but an advocate. each one is not a mere chronicler of events. each write-up has a slant. each one has a built-in filter that weeds out whatever will not suit his/her purpose. anthony, definitely interms of opinion writing, but there are standards of objectivity in reporting, however imperfectly applied. the check and balance on this being the reader/viewer and competition with other media outfits eager to point out the shortcomings of the competition. yeah… this “micro people power” idea could be the way to go. apart from diluting the response from the government, this really could be the opportunity for each constituency to remind their respective congressmen why they’re in congress to begin with. I’m not anti media. I’m anti bad-media. Has pdi run a retraction or anything yet? “Cheers” and “jeers” at an unknown (to the general public) web site doesn’t seem like much of a deterent. Nor does having a newspaper calling out his rival. The paper must retract/clarify/apologize a story itself. The board and chief editors must enforce strict codes. Or does the Truth not need to deal with such minor irritations? Lozada — I think Monsod recently proved it once she got a hold of the transcripts (http://opinion.inquirer.net/inquireropinion/columns/view/20080308-123471/Let-the-readers-judge-for-themselves). He twice said that he was invited to the house by the Arroyo couple. Drillon — His claims are unravelling right before us. Dinky — OK, I guess it’s her word vs the Cardinal’s. (I remember clearly thinking she was lying when she was arrested in a B&W “walk”, but I can’t recall the details…so it doesn’t count). Cayetano — After claiming for years that he had boxes of evidence, his one and only piece is proven beyond doubt to be 100% wrong. Manolo, the media…like ANC and PDI…is not performing its role well at all. There is no difference between opinion and reporting….except you know it’s just an opinion when it’s on the OpEd pages. The “reporters” continue to mislead the public — willfully or not. They must get back to the basics. And — as the papers continue to omit — the CBCP didn’t just call for the executive to do X, Y and Z…they also called on the media to be more balanced and honest. But, we don’t hear much about that, do we? and it regularly prints corrections in the paper. benign0, a clear resolution only in terms of depriving an accused official of life (back when we had the death penalty), liberty, or property. for moving issues to the point that they will be prosecuted, you need the rest. they all have their proper place in the democratic scheme of things. Talking about lies, it would have been tiresome to catalog the lies of Gloria, Bunye and her ilk. Start with the Garci scandal, there would be an awful lot right there. Gloria not running for President announced in public at 2004, what a laugh. Since you considered the inquirer, ANC liars, how about the NBN 4, channels 9 and 13, radio ng bayan, bunye, ermita, mendoza, to name a few? MLQ asked you this question. I will ask the same. are these gov’t TV networks doing balanced reporting? Are these gov’t officials telling the truth, half-truth or complete lies. What’s your observation? secretaries, particularly dinky soliman, to their “constituencies”. i thought constituencies ordinarily apply to people or groups represented by office holders, usually elected, such as mayors, governors, congressmen, (with local constituencies) and the senators and president (with national constituents). cabinet members are alter egos, and served only at the pleasure, of the president. they don’t have constituencies of their own and merely serve the president’s constituents on his/her behalf. attempting to influence a president’s decision, or second-guessing him/her, on the pretext that the cabinet member is following the wishes of his/her “constituent”, is, i think, impudent and presumptuous. as far as i know, nobody believes the government owned and controlled media. its obvious that they are government mouthpieces. so nobody claims that these media are more reliable than the others. agree. I was just wondering why geo singled out PDI and ANC. but in PDI’s case, what’s your opinion? Do you believe the paper has been purporting lies as geo impliedly claimed? If PDI’s has motive, what do you think would it be? For good governance, paid razzle -dazzle trumpet by the opposition, or just a paper addicted to vanity of playing dudley-do-gooders, etc. etc. if pdi’s intention is for good governance, it’s better than the contrary. If the PDI is capitalizing on the scandals because they’re more salable, I don’t see anything wrong with it. NY Times, Washington Post, CNN, BCC do the same. But on top of that, scandals involved public interest. Nevertheless, saleability of a newspaper is not because it plays up the wrong doings of public officials, but by the wide public acceptance of the messenger which they perceived credible, accurate, balanced in comparison to their competitors. On the contrary, news outfits focusing more on the wrong doings of govt, is even detrimental. They may sap the life out of a paper if not cause long paralysis if it plays around the scams even if good governance is evident. In the end, the people will be the final scalpel to weigh in what’s truth, half-truth and lies. And when a paper is not telling the truth, the circulation plummets, advertisers pull out, and if not lead to its eventual demise. Maybe, there are bad apples in the PDI, but its good men and women outnumbered the rotten ones. As its record would show, PDI stick it out to its crusade for good governance since the time of Marcos until now. Their shortcomings i think, are lesser than the benefits they contribute to our democracy. IsnÃ¢â‚¬â„¢t duterte a fascits? Kind of like Alfredo Lim but worst. brianB, what’s your basis in saying that?